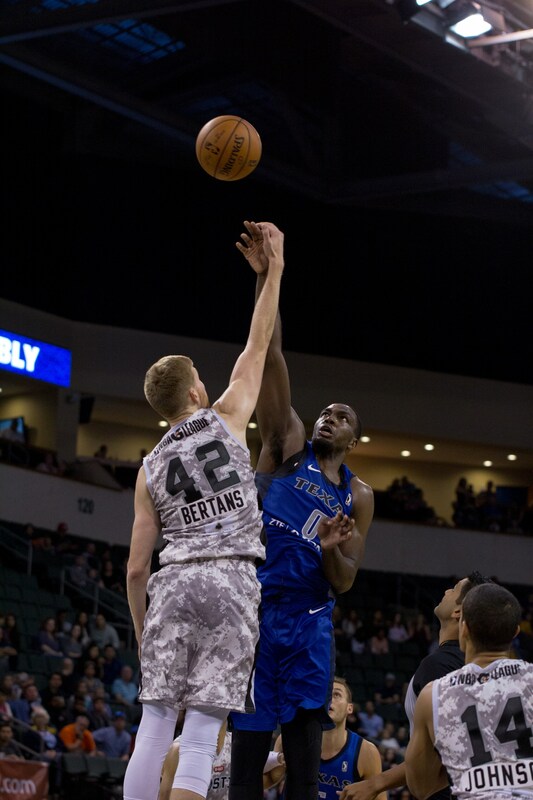 Thanks to Smith Thompson Home Security, the Texas Legends played what seemed like a home game on Saturday night. 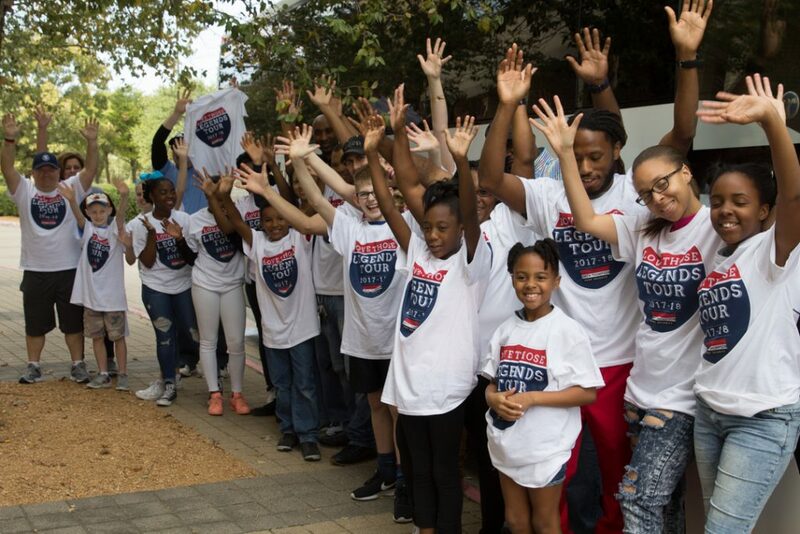 “Visiting” the Spurs in Austin, winners of the Love Those Legends Tour cheered on their hometown heroes to an exciting comeback victory. 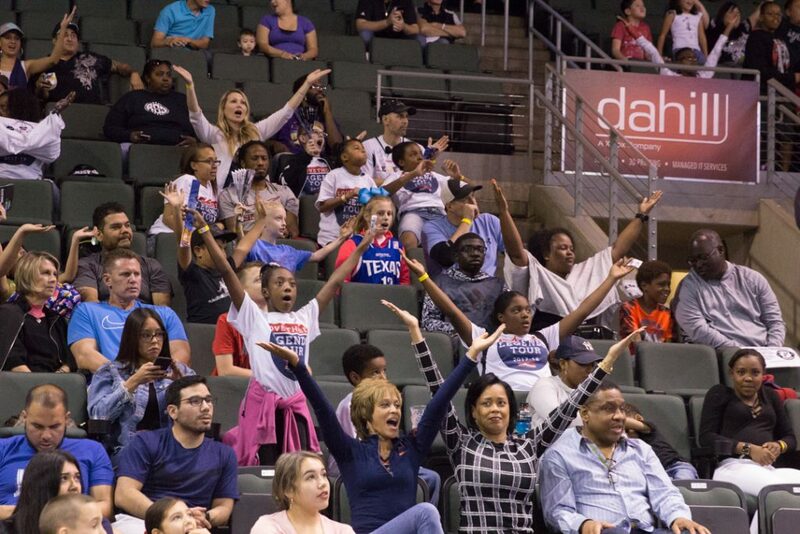 After a bus ride of movies (Space Jam was the winner) and filling up with burgers and hot dogs, the faithful fans were loud from the tip, which was quickly followed by a dunk from Mavs two-way player Johnathan Motley (15 points, five offensive rebounds) as the 2017-2018 season officially began. Legends season ticket holders for six seasons, Jim and Rebecca from The Colony took part in the Love Those Legends Tour in the 2015 season and were more than happy to get back into things. Jim’s voice was long gone by the fourth quarter and his spot on the back of the bus turned him into the trip’s unofficial concessions vendor. As fans –especially kids– trekked to the back of the bus to grab some drinks and snacks, Jim handed them out like Pierre Jackson handed out assists last season. Jim and Rebecca may be the biggest Keith Hornsby fans around, growing up idolizing his father Bruce and his band, the Grammy award winning Bruce Hornsby and the Range. Which leads us perfectly to the younger Hornsby. Keith got the starting nod in the first game of his second season and rewarded coach MacKinnon’s faith with a career-high 16 points on 7-of-11 shooting. He helped spark the comeback which started to pick up steam at the end of the third quarter. Down 19 at one point, the Legends roared all the way to tie things up at 103 with 7:15 to play. It was fittingly a Justin Dentmon three-pointer that did the deed as the returning Legends point guard led all scorers with 35 points. After eight quick points in the first frame, the veteran looked everything the player we remembered him to be and more, making 9-of-16 shots and 12-of-13 free throws as well as half of his 10 three’s. He even connected on a rare four-point play in the second frame. Another great talent reuniting with the team, Brandon Ashley came off the bench to score 19 points, including a crucial set of free throws to put the Legends up four, 115-111, with 1:52 to go. He added eight rebounds, a pair of steals and a block. Among the many exuberant faces in the Legends portion of the crowd, the Kiefer family from McKinney cheered on the good guys with passion. Discovering the Love Those Legends event via Facebook, they took home a game used jersey after correctly answering a trivia question from assistant coach Zendon Hamilton, who addressed fans in the lounge before the game. 11-year old Keenan was able to enjoy the unlimited dinner buffet (two hamburgers and a hot dog to be exact) and cheer on his favorite player Jameel Warney. Picking up right where he left off from a season ago as well as this summer in the AmeriCup, gold medal and MVP award winner Warney double-double’d with 19 points and 13 rebounds, also connecting on 7-of-10 free throws. An eventful opening night from any which way, the Legends and their fans lay claim to a 1-0 start to the 2017-2018 season. One that Coach MacKinnon was very thankful for, sending a text to staff to be read aloud to the fans as they began their bus trip home to Frisco. Thanks to the best fans in the league for opening the season with bang!